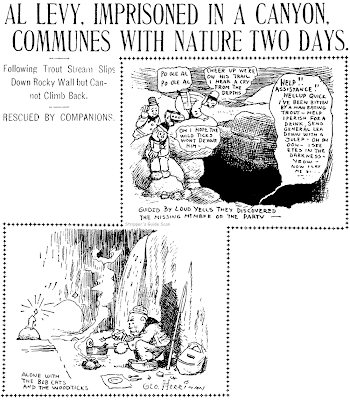 Sunday, September 1 1907 -- The accompanying story tells the saga of Al Levy, who in his quest to locate the ultimate fishing hole, got himself stuck in a box canyon outside of Seven Oaks California. To enter a promising V-shaped canyon he had to slide down a giant boulder. After a day of what did turn out to be excellent fishing he found that it was impossible to climb the boulder to exit the canyon. Luckily he had friends who knew his general vicinity and came to search when he didn't return. Levy had to spend an extra day in his prison, though, while the friends went to town to fetch ropes to help extricate him from his predicament. Sunday, September 1 1907 -- Got a little egg on my face; I was scouting around the net to gather a little more intelligence on the Gans-Britt match today. You may recall that I've been claiming all along that the fight never came about. Well, that's what the website I usually use for boxing info said, or at least that's how I interpreted it. Today, though, I found a New York Times report on the fight, describing a match that did indeed come off. Oops! Guess I don't have any boxing historians in the audience to keep me honest. Just goes to show you should take everything on the web with a grain of salt. Maybe a teaspoon's worth in my case. Anyhow, today's Herriman Britt-Gans cartoon tries very hard to draw some sort of parallel between statehood and Britt's desire to get a championship fight. In my humble opinion George stretched his analogy beyond the breaking point. Oh, well, they can't all be gems. During all the years that Tom Fanning adventured up and down the continent, taking a fling at each thing that came his way—boxing, ranching in the Southwest, running an advertising agency in Argentina and in New York—he recorded what he saw in authentic detail. The adventures were captured with pen and brush in sketch books that he saved. That authentic detail is an integral part of the illustrations for the "Tex Austin" daily comic strip, being released by New York Post Syndicate to newspapers March 21. A Sunday page will begin March 27. It is the fruition of a long dream for Fanning. Now past 40, he worked up his first strip at 18. It flopped. "The gags weren't good enough," he explains. He didn't take a chance like that again. This time the gags and continuity are being written by a long-time friend, Sam Robins, who spent six years in Hollywood turning out original screenplays. Robins scripted "Dead End Kid" stories, "Hopalong Cassidy," "Billy the Kid" yarns, and musicals. He fathered one of the first anti-Nazi pictures, "Enemy Agent." Robins, formerly a reporter on the New York Times, has in many ways a career that parallels Fanning's. He too wanted to be an artist, but it turned out that his talent for expression made him a writer. Robins was one of the top writers of film documentaries, so popular at the war's end. He was far into a novel with a background in Texas when Fanning showed him the "Tex Austin" strip. Robins was drafted. The strip combines the Texas and New York locales of boxers and ranchers. The western continuity is done in a realistic vein, dealing as often with mining, oil, and dude ranching as with old-fashioned buckaroos. After Fanning had hit the road through Western America until boxing was becoming a past, he turned to New York, where he worked as advertising illustrator and art director. In his home town, Minneapolis, he had gone to the School of Fine Arts. He went from New York to Montreal in advertising, then to the Argentine, where he helped organize an advertising agency and, more important to him, had time to draw Argentine boxers and gauchos. In 1940 he joined the Argentine branch of J. Walter Thompson Co., three years later became vice president of Grant Advertising, Inc., later moving to New York. Ultimately he took on the presidency of Trans World Advertising, specializing in export. When exchange and export difficulties became too much to cope with, he tossed the executive hat out the window and gambled on the strip. Together, Fanning, Robins and Bob Hall of the syndicate worked the idea out until they came up with what they call "the perfect story." But Fanning wasn't satisfied until he got the approval of his 20-year-old daughter, who he says is his best critic. So, the strip goes ahead, and down in South America, beautiful Argentine Mrs. Fanning is preparing to join the family. This sounds so crazy that I'd like to see an example of it! Has anyone seen this strip? Boxers and cowboys, realistic and gags...wonder what sort of style it was drawn in. Here's a nice early mad scientist strip, in fact darn close to the earliest I can think of. The Chicago Daily News' The Absent-Minded Man, which featured a forgetful scientist, edges it out by about a month, but the accent in that strip was more on his poor memory, and Willie Westinghouse Edison Smith, about a boy inventor, beats it by about 7 months. Anyhow, of the three Professor Gesla is certainly the most typical of the mad scientist strips that would be very popular in the decade of the 1900s, so we can probably give it the nod as the first to fit neatly in that genre. The strip was penned by the great, though sadly almost forgotten, Clare Victor "Dwig" Dwiggins, one of the most popular creators of the first few decades of the century. His wispy, delicate linework and boisterous characters were much imitated and his services were highly sought, and so he flitted from syndicate to syndicate, presumably lured on from place to place by offers from covetous editors. He produced Professor Gesla for the Philadelphia Inquirer, which as far as I know was the very first syndicate he worked for. 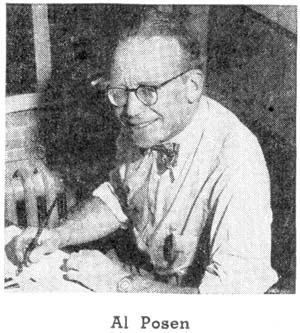 He produced continuing strips for the Inquirer from 1900-1902, then disappeared for awhile from newspaper comics. He got pretty heavily into illustrating books for a time before returning to the fourth estate. Professor Gesla appeared on an infrequent basis between February 3 1901 and March 30 1902. Dwig produced just 10 episodes in all of the series. Thanks very much to Cole Johnson who supplied the sample of this strip. You're absolutely right, Dwig has been unfairly forgotten. Allan, do you think that "Gesla" might have been a play on Tesla? Absolutely; Tesla was much in the news in those days. Cole also pointed that out when he sent me the sample. Leave it to my sieve-brain to forget to mention it. Al Posen is a rare New Yorker. He was born in New York, and goes out West every year because he likes to ride cowponies. However, he may wind up singing "Them Days Are Gone Forever," as he expects his new comic strip, "Rhymin' Time," to keep him too busy for riding. Four years after World War I, Posen conceived the famed strip, "Them Days Are Gone Forever," which featured a three-line rhyme and ended up with the title theme. It was a popular comic, was often clipped out of local papers and pinned up in barber shops because of the strip's universal, nostalgic appeal. Posen went on with it until he signed up with the Chicago Tribune Syndicate in 1927, having sold to Patterson the idea for the four-word "Jinglets," ancestor of the present-day Sweeney of Chicago Tribune-New York News Syndicate. Using the theme song that previously proved popular, technically set to "Turkey in the Straw," Rhymin' Time is by a maturer and more practiced artist. The feature will be released daily, beginning Jan. 17. Posen, although admitting life was more fun when he had to do only a Sunday feature, has become enthusiastic about Rhymin' Time. He insists that now it is specially apt, as he sees a trend toward nostalgic strips and the rhyming idea has always had appeal. He is nearly as often editorial as humorous in his strip concept. And, Gosh, is my face red! Hurls insults at my head! They used to think me wonderful. Them Days Are Gone Forever. Posen, a bachelor, has found time each winter to go to Lake Placid, N. Y. (he's an ardent skier), or on a ranch out in Wyoming. He learned to ride in China, where he went as member of a research expedition sent out by a mining syndicate. The experience also included a year in Siam and Yunan. With other friends of the Marx Brothers, Posen once produced the first movie of the then-noted vaudeville team. It was a two-reeler that flopped financially. Posen and his associates went around, carrying the reels under their coats and begging show houses to show the film. Prior to Sweeney, now about 15 years old, Posen did "Ella and Her Fella," and for several years has been doing illustrated continuities for advertising. Posen was a soldier in World War I, and worked for a film advertising agency as soon as it ended. He had no art schooling, but always desired to draw. The more colorful episodes in his life, he says, were just stepping stones to becoming a comics cartoonist. Hello, Allan---The Marx Bros. film mentioned that Al(vah) Posen produced was the two-reeler "HUMOR RISK" (Caravel 21). It was supposed to be the first in a series of six, but this initial film did not elicit interest from any distributor, and the project was scrapped. Posen had a copy of it, and supposedly it was brought out sometimes to tease the Marxes after their success in Hollywood. HUMOR RISK is now among the most sought-after lost films. Keep your eyes open at the next church sale!--Cole Johnson. I was lucky enough to purchase three of the engraving plates of his "Them Days Are Gone Forever" strip yesterday. I love comic strips and I'm trying to learn as much as I can about the Artist and these plates. Does anyone know more about this and where I can find more information? The Boston Herald just couldn't make up its mind whether it wanted to run a syndicate or not in the first decade of the previous century. Their homegrown comic section was born and died at least four different times in the course of that decade. 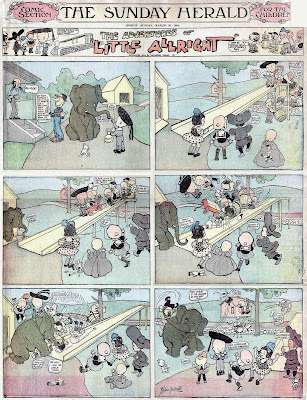 The Adventures of Little Allright came in the third version of their Sunday section and ran from March 6 to June 26 1904. There really wasn't much to set the strip apart from any other kid strip -- the starring kid saying "all right" a lot seems an almost ridiculously weak hook. Wallace Goldsmith, primarily an editorial cartoonist and practically a Boston institution (over his long career he would be featured at the Herald, the Post and the Globe) took the dubious credit for this stinker. 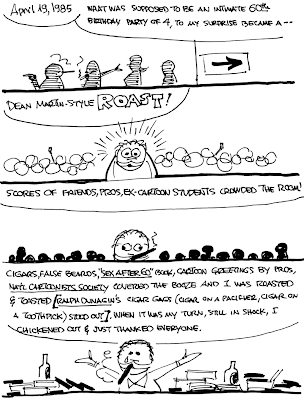 Goldsmith resurrected his strip in the fourth generation of the Herald's Sunday section, too. It was renamed slightly, now just Little Alright (note the second 'L' was dropped). This time the strip ran from November 11 1906 to April 14 1907. A tip of the hat to Cole Johnson for the sample strip. Today is Memorial Day, so let's do a strip that has some slight military connection. Of course our Obscurity of the Day isn't the Milton Caniff classic version of Terry and the Pirates, but the revival from the 1990s. The original Terry ended in 1973 just short of its 40th anniversary. After Caniff left at the end of 1946 to create Steve Canyon it was ably continued by George Wunder for the rest of its run. Terry's 1973 demise is owed mostly to the unpopular Vietnam war, which impacted the country in so many ways, even to our taste in comic strips. In the 90s, though, after the much more popular first Iraq war, apparently Tribune Media Services was willing to give the genre another try. The new version of the strip was actually just part of a projected Terry media onslaught. Michael Uslan, who wrote the strip, was a movie producer coming off the huge success of the new Batman movies. He wanted to create a TV show of Terry, and a new version of the comic strip was to be a sounding board to test the popularity of the idea. As Uslan stated at the time that the Terry strip debuted, "We are in the business of building franchises." Uslan brought some heavy guns to bear on the strip revival by hiring the Hildebrandt brothers as artists for the series. The Hildebrandts were famed for their fantasy and science fiction paintings and had a huge fan following. The modernized Terry and the Pirates centers on, of course, the Dragon Lady, now a hi-tech combination businesswoman/pirate working out of Tokyo with all sort of futuristic gewgaws. Terry and Pat are in a quasi-military group known as The Alliance, dedicated to foiling the Tokyo pirate trade. The strip looked fantastic and the stories were some seriously hard-boiled stuff. Quite a few papers jumped on board for what obviously had a shot at becoming that unlikelist of successes, a modern-day adventure comic strip [Edit: Jeffrey Lindenblatt says the initial subscriber roster was a paltry 20 papers -- I stand corrected]. However, it was not to be. The fabulous art on the feature was ruined by tiny reproduction, and older readers vociferously objected to the updated punky versions of the classic characters. Then Uslan lost interest when it became obvious that a Terry and the Pirates TV show was never going to make it to the air. The high-powered pairing of Uslan and the Hildebrandts came to an end after a one year contract -- their stint began on March 26 1995 and ended March 31 1996. Apparently either Tribune Media or franchise-builder Uslan wasn't willing to completely give up on the project though. A new creative team was assigned to the strip. Jim Clark took over the writing and Dan Spiegle the art. From a scattering of reports, the new pair did a good job on the strip, but best of luck finding them to read. 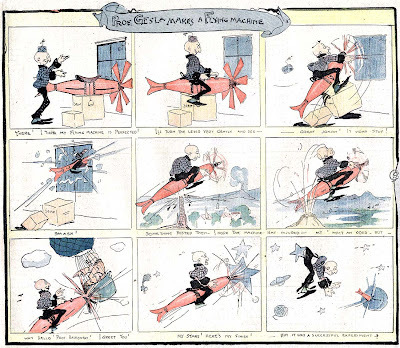 Many comics page editors dumped the strip even before the end of the first year, and when the creative team changed the sinking ship took on water quickly. By the time the strip was finally dumped by TMS on July 27 1997 the number of clients was miniscule -- I wouldn't be surprised if they were in single digits [EDIT: And Lindenblatt concurs -- see his comment below]. by the production error-prone ACG-Avalon company. I'm sure this is almost as rare as the strip. Well, I'll be darned. Sure nuff. Any idea what sort of quality there was on these? The cover shots on eBay make them look like pretty primitive productions. Is ACG the same as Bill Black's old Americomics imprint or a different company? Black ran (and still does) AC. The ACG-Avalon (which also used Sword in the Stone, A+, and Charlton) was a Canadian company owned by Roger Broughton. They bought the rights to most of the Charlton comics and ACG. This is one of those posts that makes no sense if you only read the title. What? Terry and the Pirates? Obscure?? What kind of comic strip historian are you, Allan? Oh. Not the Caniff one. Got it. Cool. But it's true: adventure strips have gone out of style. People prefer more visual strips, and less reading. The only adventure strips still left are only there because they've been around forever. Prince Valiant comes to mind. I figure anyone wanting to do an adventure strip these days would just settle for making a comic book/graphic novel. It would probably sell much better. The list of papers that were running Terry are listed in one my earliest articles in Hogan Alley. It never had more than 20 when it started. At the end I believe only two papers ran the entire run. The Chicago Tribune and The New York Daily News. Intresting is that the New York Daily News ran every Terry daily and Sunday except for the final three weeks of George Wunder back in 1973. I remember when the revived strip ran in the Chicago Tribune, and I was happy to see a new adventure strip on the page at all - even if it was an old one. I wasn't happy with the more science fictional elements. Perhaps newer writers don't know HOW to write a dramatic series without that sort of thing. I recall the dramatic visual shift when Dan Spiegle took over the art. A much more rough, more traditional strip look. Spiegle was usually great, but I still got the impression that he was marking time until the strip had breathed its last. The Indianapolis Star ran a good portion of the updated Terry and the Pirates, even after Uslan and the Hildebrandts departed. I'm not sure the Star ran the entire strip, though. Dan Spiegle's art was very different from the Hildebrandts' art, but in my mind, there was no drop in quality when he took over. By the way, Uslan has another connection with Indiana: he attended Indiana University and is supposed to have taught the first college course on comic books in the United States.